Samuel Hollander’s work has been provoking debate for over four decades. This book brings together key contributions of recent years, in addition to some brand new pieces. The essays are introduced by a Preface in which Hollander reflects on his past work and reactions to it. Highlights include two issues of particular current relevance. Conspicuous is an extensive chapter regarding Adam Smith’s often neglected arguments for government intervention in the economy to correct market failures, and his critical view of the business class as an anti-social force. Important economists considered in relation to Adam Smith’s position on the role of the state include Jeremy Bentham and the Scottish-Canadian John Rae. Similarly of high present-day interest is a re-examination of Karl Marx’s theory of exploitation, or the notion of profits as "embezzlement," demonstrating Marx’s effective abandonment of this perspective in the case of the small active businessman as distinct from the major joint-stock corporation. Other papers demonstrate the close intellectual relationship between David Ricardo and Thomas Robert Malthus; the extensive common ground between the British school and the French under the leadership of Jean-Baptiste Say; the failure of a so-called anti-Ricardian opposition in Britain represented by Samuel Bailey; and the denial of a sharp discontinuity between "classical" and later "neo-classical" economics. Finally, several biographical essays are included as well as an extension of the autobiographical account appearing in　Collected Essays II. 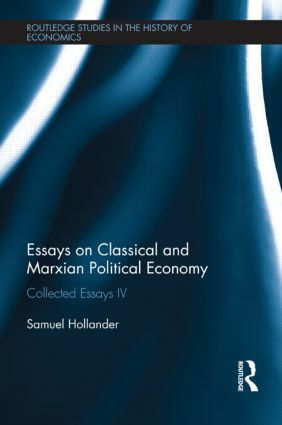 Samuel Hollander is University Professor Emeritus at the University of Toronto, Canada, where he served on the faculty from 1963 to 1998, and is currently affiliated with the Department of Economics at Ben-Gurion University, Israel. An Officer of the Order of Canada and a Fellow of the Royal Society of Canada, Professor Hollander holds an honorary Doctorate of Laws from McMaster University, Ontario, Canada, and was a Research Director at the Centre National de la Recherche Scientifique (CNRS) of France, 1999-2000.